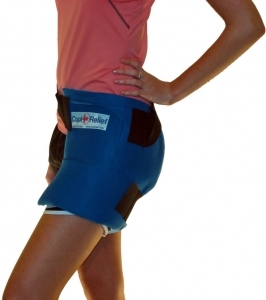 Soft Gel Hip Ice Wrap by Cool Relief: Cool Relief is one of the few companies that manufacture an ice wrap specifically for the hip area. Most companies focus on developing products for other areas of injury such as the shoulder, knee, or back, but many forget the impact of an injury to this region making this product valuable. Soft/Gel: This hip ice wrap features the revolutionary soft gel insert pioneered by Cool Relief’s product design team. Individually wrapped “ice pillows” suspended throughout the gel can be relocated and targeted towards the source of the pain while keeping the gel colder longer. This product is made with a micromesh and foam sleeve using an attached 3” wide elastic adjustment strap and a 3“ detached elastic strap for compression. Like all Cool Relief products it features interior focused icing technology. The micromesh material on the inside (or body side) is designed to safely direct cold towards the hip injury while the soft foam on the outer covering redirects the cold back into the wrap and towards the hip thorough the micromesh material. The elastic straps provide compression when wrapped around the leg and the waist then affixed to the foam material. Built to last, the only wear and tear this item received in testing was on the foam sleeve with the placement and removal of the Velcro attached to the elastic straps. Even though this product ranks on the higher end of the price scale for hip ice wraps on the market and available at coolrelief.net, it’s still a moderately priced unit over-all which is why it receives three dollar signs rather than four. Of the few ice wraps on the market designed specifically for the hip area, this is a consumer favorite with its soft gel insert and durable elastic adjustment straps. If you need a soft gel hip ice pack for sensitive pain relief in the hip area this product definitely outdoes the rest.